When we sing lines in which a fifteenth-century musician uses ethereal polyphony to complain mundanely about money or hoarseness, more than half a millennium melts away. Equally intriguing are moments in which we experience solmization puns. These familiar worries and surprising jests break down temporal distances, humanizing the lives and endeavors of our musical forebears. Yet many instances of self-reference occur within otherwise serious pieces. Are these simply in-jokes, or are there more meaningful messages we risk neglecting if we dismiss them as comic relief? Music historian Jane D. Hatter takes seriously the pervasiveness of these features. Divided into two sections, this study considers pieces with self-referential features in the texts separately from discussions of pieces based on musical self-referential elements. Examining connections between self-referential repertoire from the years 1450–1530 and similar self-referential creations for painters' guilds, reveals musicians' agency in forming the first communities of early modern composers. 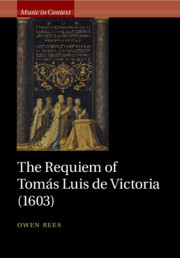 Victoria's Requiem is among the best-loved and most-performed musical works of the Renaissance, and is often held to be 'a Requiem for an age', representing the summation of golden-age Spanish polyphony. Yet it has been the focus of surprisingly little research. Owen Rees's multifaceted study brings together the historical and ritual contexts for the work's genesis, the first detailed musical analysis of the Requiem itself, and the long story of its circulation and reception. Victoria composed this music in 1603 for the exequies of María of Austria, and oversaw its publication two years later. A rich variety of contemporary documentation allows these events - and the nature of music in Habsburg exequies - to be reconstructed vividly. Rees then locates Victoria's music within the context of a vast international repertory of Requiems, much of it previously unstudied, and identifies the techniques which render this work so powerfully distinctive and coherent. Part of the seminal Cambridge History of Music series, this volume departs from standard histories of early modern Western music in two important ways. First, it considers music as something primarily experienced by people in their daily lives, whether as musicians or listeners, and as something that happened in particular locations, and different intellectual and ideological contexts, rather than as a story of genres, individual counties, and composers and their works. Second, by constraining discussion within the limits of a 100-year timespan, the music culture of the sixteenth century is freed from its conventional (and tenuous) absorption within the abstraction of 'the Renaissance', and is understood in terms of recent developments in the broader narrative of this turbulent period of European history. 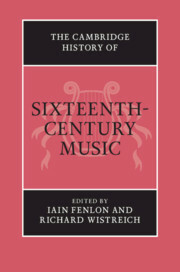 Both an original take on a well-known period in early music and a key work of reference for scholars, this volume makes an important contribution to the history of music. Musical notation has not always existed: in the West, musical traditions have often depended on transmission from mouth to ear, and ear to mouth. Although the Ancient Greeks had a form of musical notation, it was not passed on to the medieval Latin West. 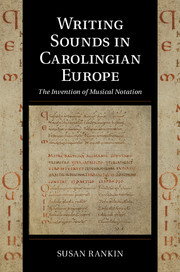 This comprehensive study investigates the breadth of use of musical notation in Carolingian Europe, including many examples previously unknown in studies of notation, to deliver a crucial foundational model for the understanding of later Western notations. An overview of the study of neumatic notations from the French monastic scholar Dom Jean Mabillon (1632–1707) up to the present day precedes an examination of the function and potential of writing in support of a musical practice which continued to depend on trained memory. Later chapters examine passages of notation to reveal those ways in which scripts were shaped by contemporary rationalizations of musical sound. Finally, the new scripts are situated in the cultural and social contexts in which they emerged. The musica secreta or concerto delle dame of Duke Alfonso II d'Este, an ensemble of virtuoso female musicians that performed behind closed doors at the castello in Ferrara, is well-known to music history. Their story is often told by focussing on the Duke's obsessive patronage and the exclusivity of their music. 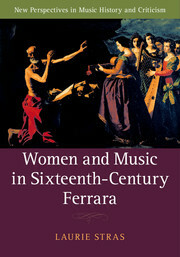 This book examines the music-making of four generations of princesses, noblewomen and nuns in Ferrara, as performers, creators, and patrons from a new perspective. It rethinks the relationships between polyphony and song, sacred and secular, performer and composer, patron and musician, court and convent. 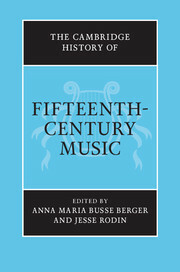 With new archival evidence and analysis of music, people, and events over the course of the century, from the role of the princess nun musician, Leonora d'Este, to the fate of the musica secreta's jealously guarded repertoire, this radical approach will appeal to musicians and scholars alike. 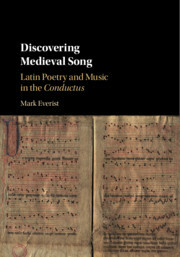 This volume explores the work of one of medieval music's most important figures, and in so doing presents an extended panorama of musical life in Europe at the end of the middle ages. Guillaume Du Fay rose from obscure beginnings to become the most significant composer of the fifteenth century, a man courted by kings and popes, and this study of his life and career provides a detailed examination of his entire output, including a number of newly discovered works. As well as offering musical analysis, this volume investigates his close association with the Cathedral of Cambrai, and explores how, at a time when music was becoming increasingly professionalised, Du Fay forged his own identity as 'a composer'. This detailed biography will be highly valuable for those interested in the history of medieval and church music, as well as for scholars of Du Fay's musical legacy. 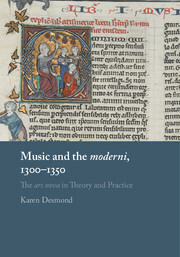 Music theorists labelled the musical art of the 1330s and 1340s as 'new' and 'modern'. A close reading of writings on music theory and the polyphonic repertory from the first half of the fourteenth century reveals a modern musical art that arose due to specific innovations in music notation. The French ars nova employed as its theoretical fundament a new system for arranging musical time proposed by the astronomer and mathematician Jean des Murs. Challenging prevailing accounts of the ars nova, this book presents the 'new art' within the intellectual context of its time, revises the datings of Jean des Murs's writings on music theory, and presents the intersection of theory and practice for a crucial era in the history of music. Through contemporaneous accounts, Desmond explores how individuals were involved in 'changing' music in early fourteenth-century France, and the technical developments they pursued that precipitated this stylistic change. The Conductus repertory is the body of monophonic and polyphonic non-liturgical Latin song that dominated European culture from the middle of the twelfth century to the beginning of the fourteenth. In this book, Mark Everist demonstrates how the poetry and music interact, explores how musical structures are created, and discusses the geographical and temporal reach of the genre, including its significance for performance today. The volume studies what medieval society thought of the Conductus, its function in medieval society - whether paraliturgical or in other contexts - and how it fitted into patristic and secular Latin cultures. The Conductus emerges as a genre of great poetic and musical sophistication that brought the skills of poets and musicians into alignment. 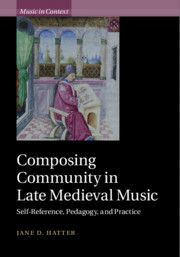 This book provides an all-encompassing view of an important but unexplored repertory of medieval music, engaging with both poetry and music even-handedly to present new and up-to-date perspectives on the genre. Spanning a millennium of musical history, this monumental volume brings together nearly forty leading authorities to survey the music of Western Europe in the Middle Ages. All of the major aspects of medieval music are considered, making use of the latest research and thinking to discuss everything from the earliest genres of chant, through the music of the liturgy, to the riches of the vernacular song of the trouvères and troubadours. Alongside this account of the core repertory of monophony, The Cambridge History of Medieval Music tells the story of the birth of polyphonic music, and studies the genres of organum, conductus, motet and polyphonic song. Key composers of the period are introduced, such as Leoninus, Perotinus, Adam de la Halle, Philippe de Vitry and Guillaume de Machaut, and other chapters examine topics ranging from musical theory and performance to institutions, culture and collections. 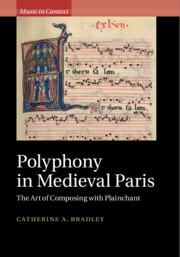 Polyphony associated with the Parisian cathedral of Notre Dame marks a historical turning point in medieval music. Yet a lack of analytical or theoretical systems has discouraged close study of twelfth- and thirteenth-century musical objects, despite the fact that such creations represent the beginnings of musical composition as we know it. Is musical analysis possible for such medieval repertoires? Catherine A. Bradley demonstrates that it is, presenting new methodologies to illuminate processes of musical and poetic creation, from monophonic plainchant and vernacular French songs, to polyphonic organa, clausulae, and motets in both Latin and French. This book engages with questions of text-music relationships, liturgy, and the development of notational technologies, exploring concepts of authorship and originality as well as practices of quotation and musical reworking. Plague, a devastating and recurring affliction throughout the Renaissance, had a major impact on European life. Not only was pestilence a biological problem, but it was also read as a symptom of spiritual degeneracy and it caused widespread social disorder. 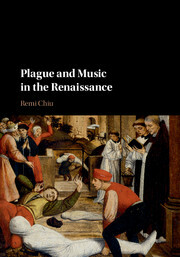 Assembling a picture of the complex and sometimes contradictory responses to plague from medical, spiritual and civic perspectives, this book uncovers the place of music - whether regarded as an indispensable medicine or a moral poison that exacerbated outbreaks - in the management of the disease. This original musicological approach further reveals how composers responded, in their works, to the discourses and practices surrounding one of the greatest medical crises in the pre-modern age. Addressing topics such as music as therapy, public rituals and performance and music in religion, the volume also provides detailed musical analysis throughout to illustrate how pestilence affected societal attitudes toward music. Music has been an essential constituent of Shakespeare's plays from the sixteenth century to the present day, yet its significance has often been overlooked or underplayed in the history of Shakespearean performance. 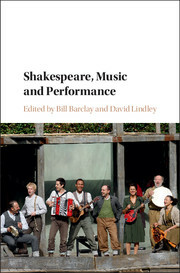 Providing a long chronological sweep, this collection of essays traces the different uses of music in the theatre and in film from the days of the first Globe and Blackfriars to contemporary, global productions. With a unique concentration on the performance aspects of the subject, the volume offers a wide range of voices, from scholars to contemporary practitioners (including an interview with the critically acclaimed composer Stephen Warbeck), and thus provides a rich exploration of this fascinating history from diverse perspectives. 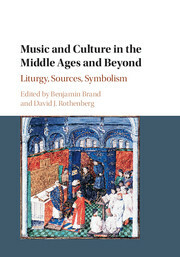 It has become widely accepted among musicologists that medieval music is most profitably studied from interdisciplinary perspectives that situate it within broad cultural contexts. The origins of this consensus lie in a decisive reorientation of the field that began approximately four decades ago. 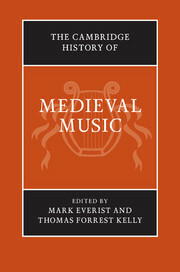 For much of the twentieth century, research on medieval music had focused on the discovery and evaluation of musical and theoretical sources. The 1970s and 1980s, by contrast, witnessed calls for broader methodologies and more fully contextual approaches that in turn anticipated the emergence of the so-called 'New Musicology'. The fifteen essays in the present collection explore three interrelated areas of inquiry that proved particularly significant: the liturgy, sources (musical and archival), and musical symbolism. In so doing, these essays not only acknowledge past achievements but also illustrate how this broad, interdisciplinary approach remains a source for scholarly innovation. This innovative and multi-layered study of the music and culture of Renaissance instrumentalists spans the early institutionalization of instrumental music from c.1420 to the rise of the basso continuo and newer roles for instrumentalists around 1600. 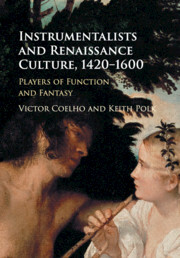 Employing a broad cultural narrative interwoven with detailed case studies, close readings of eighteen essential musical sources, and analysis of musical images, Victor Coelho and Keith Polk show that instrumental music formed a vital and dynamic element in the artistic landscape, from rote function to creative fantasy. Instrumentalists occupied a central role in courtly ceremonies and private social rituals during the Renaissance, and banquets, dances, processions, religious celebrations and weddings all required their participation, regardless of social class. Instrumental genres were highly diverse artistic creations, from polyphonic repertories revealing knowledge of notated styles, to improvisation and flexible practices. Understanding the contributions of instrumentalists is essential for any accurate assessment of Renaissance culture. Few now remember that the guitar was popular in England during the age of Queen Elizabeth and Shakespeare, and yet it was played everywhere from the royal court to the common tavern. This groundbreaking book, the first entirely devoted to the renaissance guitar in England, deploys new literary and archival material, together with depictions in contemporary art, to explore the social and musical world of the four-course guitar among courtiers, government servants and gentlemen. 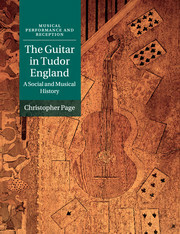 Christopher Page reconstructs the trade in imported guitars coming to the wharves of London, and pieces together the printed tutor for the instrument (probably of 1569) which ranks as the only method book for the guitar to survive from the sixteenth century. Two chapters discuss the remains of music for the instrument in tablature, both the instrumental repertoire and the traditions of accompanied song, which must often be assembled from scattered fragments of information. Through forty-five creative and concise essays by an international team of authors, this Cambridge History brings the fifteenth century to life for both specialists and general readers. Combining the best qualities of survey texts and scholarly literature, the book offers authoritative overviews of central composers, genres, and musical institutions as well as new and provocative reassessments of the work concept, the boundaries between improvisation and composition, the practice of listening, humanism, musical borrowing, and other topics. Multidisciplinary studies of music and architecture, feasting, poetry, politics, liturgy, and religious devotion rub shoulders with studies of compositional techniques, musical notation, music manuscripts, and reception history. Generously illustrated with figures and examples, this volume paints a vibrant picture of musical life in a period characterized by extraordinary innovation and artistic achievement. The manuscript sources of medieval song rarely fit the description of 'songbook' easily. Instead, they are very often mixed compilations that place songs alongside other diverse contents, and the songs themselves may be inscribed as texts alone or as verbal and musical notation. This book looks afresh at these manuscripts through ten case studies, representing key sources in Latin, French, German, and English from across Europe during the Middle Ages. Each chapter is authored by a leading expert and treats a case study in detail, including a listing of the manuscript's overall contents, a summary of its treatment in scholarship, and up-to-date bibliographical references. 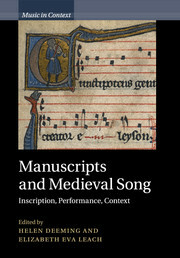 Drawing on recent scholarly methodologies, the contributors uncover what these books and the songs within them meant to their medieval audience and reveal a wealth of new information about the original contexts of songs both in performance and as committed to parchment. Since her death in 1179, Hildegard of Bingen has commanded attention in every century. 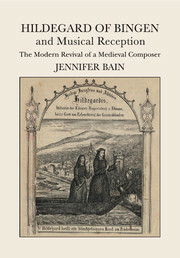 In this book Jennifer Bain traces the historical reception of Hildegard, focusing particularly on the moment in the modern era when she began to be considered as a composer. Bain examines how the activities of clergy in nineteenth-century Eibingen resulted in increased veneration of Hildegard, an authentication of her relics, and a rediscovery of her music. The book goes on to situate the emergence of Hildegard's music both within the French chant restoration movement driven by Solesmes and the German chant revival supported by Cecilianism, the German movement to reform Church music more generally. 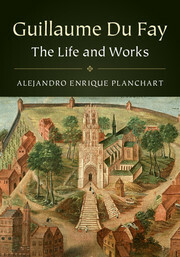 Engaging with the complex political and religious environment in German speaking areas, Bain places the more recent Anglophone revival of Hildegard's music in a broader historical perspective and reveals the important intersections amongst local devotion, popular culture, and intellectual activities. Throughout the Renaissance, composers often expressed themselves in a language of riddles and puzzles, which they embedded within the music and lyrics of their compositions. 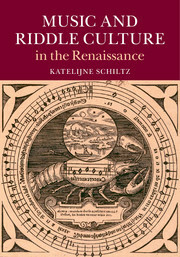 This is the first book on the theory, practice and cultural context of musical riddles during the period. Katelijne Schiltz focuses on the compositional, notational, practical, social and theoretical aspects of musical riddle culture c.1450–1620, from the works of Antoine Busnoys, Jacob Obrecht and Josquin des Prez to Lodovico Zacconi's manuscript collection of Canoni musicali. Schiltz reveals how the riddle both invites and resists interpretation, the ways in which riddles imply a process of transformation and the consequences of these aspects for the riddle's conception, performance and reception. Lavishly illustrated and including a comprehensive catalogue by Bonnie J. Blackburn of enigmatic inscriptions, this book will be of interest to scholars of music, literature, art history, theology and the history of ideas. 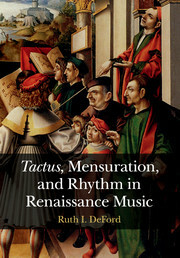 Ruth I. DeFord's book explores how tactus, mensuration, and rhythm were employed to articulate form and shape in the period from c.1420 to c.1600. Divided into two parts, the book examines the theory and practice of rhythm in relation to each other to offer new interpretations of the writings of Renaissance music theorists. In the first part, DeFord presents the theoretical evidence, introduces the manuscript sources and explains the contradictions and ambiguities in tactus theory. The second part uses theory to analyse some of the best known repertories of Renaissance music, including works by Du Fay, Ockeghem, Busnoys, Josquin, Isaac, Palestrina, and Rore, and to shed light on composers' formal and expressive uses of rhythm. DeFord's conclusions have important implications for our understanding of rhythm and for the analysis, editing, and performance of music during the Renaissance period.